For decades the familiar honey bee has been a frequent visitor to backyard apple and cherry trees each spring throughout much of the U.S. People with fruit trees usually did not know who owned the honeybees that pollinated blossoms on their property. It was generally assumed that bees would simply show up at the right time and provide the required pollination service. However, times are changing as many backyard fruit growers are reporting that they no longer see even a single honey bee on their trees. 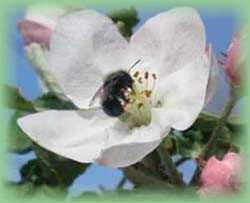 Other fruit producers living in rural areas are seeing very few honeybees as well. The small clusters of local resident hives once commonly seen in the countryside that provided significant pollination benefits to many are now disappearing. In recent years beekeepers have faced many new challenges. Zoning laws are making it harder to keep bee hives near residential areas. Problems with parasitic mites in hives and the threat of Africanized honeybee encroachment into new areas have discouraged many beekeepers from continuing their trade. As a result, the number of honeybee hives available for pollination has dropped. 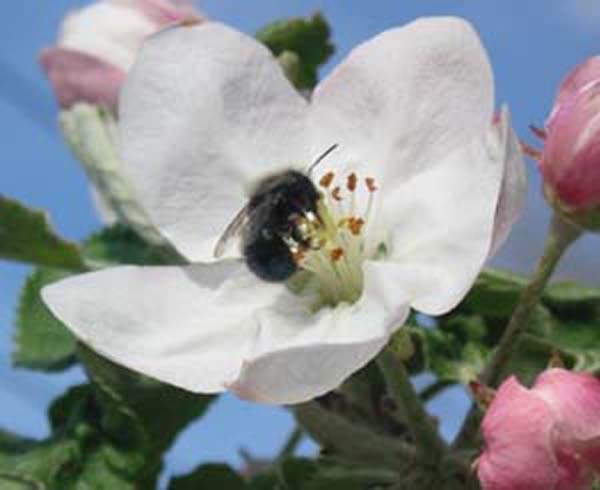 For these reasons many fruit growers, both commercial and amateur, are now more directly involved in the pollination aspect of their fruit production. All content on this site (text and photographic images) is Copyrighted 2016 (c) by Dale C. Nielson. No permission is granted for use elsewhere.